There are dozens of ways to use tomato products in your recipes. When Dei Fratelli sent me another assortment of their quality tomato products for this review and giveaway, I was delighted because I cook with them more days than not! I was sent a 28 oz. can of Petite Diced Tomatoes, Seasoned Diced Tomatoes, All Purpose Italian Sauce and Whole Tomatoes, 26 oz. jar of Homestyle Pasta Sauce, 16 oz. jar of Casera Salsa, and 15 oz. can of Sloppy Joe Sauce and Pizza Sauce. If you want to save money and time, drop some pounds before the holidays, eat something healthy and satisfying, then I really wish you would try this recipe. 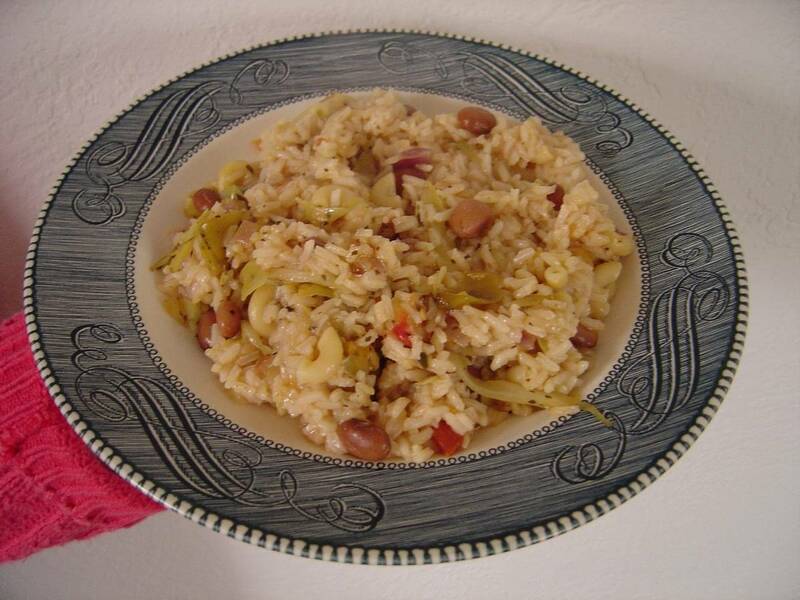 This vegetarian dish has rice, pinto beans, onion, peppers, and cabbage to lend sweetness to the spices, salsa, and pasta sauce that once combined turn this into something incredibly delicious. I honestly love it and make this dinner quite often. Trust me, dear readers, the pounds will melt off without trying if only you eat this as a main dish a few times a week. Add your finely chopped onion, chopped pepper, and fresh cabbage that you slice into thin diagonal strips into the pot with your olive oil and cook until onions become golden and the cabbage cooks some and softens a bit. Next add your raw rice and macaroni, stir in sugar, salt, and spices and cook for a few minutes until thoroughly combined. Now add your water, cooked pinto beans, the sauces, and cook this on high until it comes to a boil. Then cover with a lid and lower the heat to low and cook for about 20 minutes until the rice is fluffy. 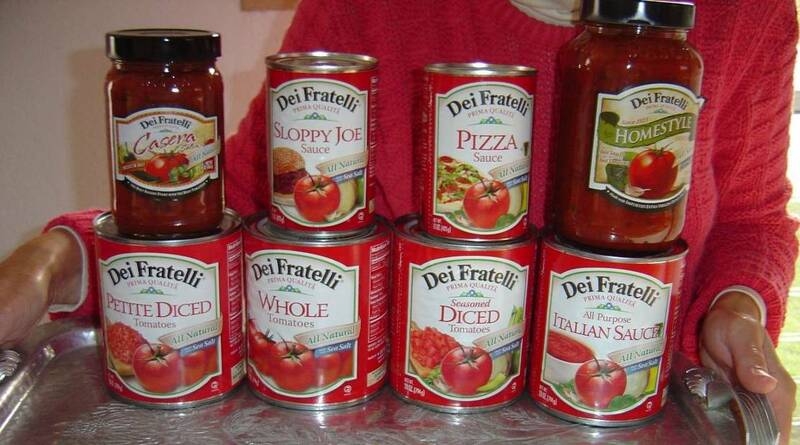 Thanks to Dei Fratelli and the Hirzel Canning Company, one lucky Nuts 4 Stuff reader in the United States wins the same assortment of tomato products that I received: a 28 oz. can of Petite Diced Tomatoes, Seasoned Diced Tomatoes, All Purpose Italian Sauce and Whole Tomatoes, 26 oz. jar of Homestyle Pasta Sauce, 16 oz. jar of Casera Salsa, and 15 oz. can of Sloppy Joe Sauce and Pizza Sauce. 1. You must follow me on Google Friends Connect before any of your entries will count. If you already follow, then tell me the name you go by in a comment. 2. Go to Dei Fratelli’s website and tell me which product you would love to try first or something you learned from their site in another comment. Leave a separate comment for each entry. Be sure you include your email address inside your comment so I can contact you if you win. This giveaway is only open to residents of the United States. Do follow the rules because I check entries. Be alert that if you attempt to enter using multiple identities will be grounds for disqualification. This giveaway ends December 2, 2011 at 12 PM Eastern Standard Time. The winner will need to respond to my email with name and shipping address within 48-hours or another winner will be picked. Previous Post How to Simplify Meal Preparation and Save Time! I would like to try the Baked Hamburger Casserole recipe with the Tomato sauce. My husband loves hamburger. They have some great recipes. I want to try the medium original salsa. I would like to try the Casera Salsa first. I like to make homemade pizza so I would choose the pizza sauce. Would like to try the Arrabiatta Sauce. GFC follower: Atreau.I would love to try the Arrabbiata Pasta Sauce. id love to try the Presto! Italian Dip 12 oz. Hello, how are you today? Thank you for this delicious opportunity. I would like to try the 'Silver Fleece' Sauerkraut. I am following, liking, joining and subscribing. I learned that the company is located in Toledo, Ohio. I tweeted about this giveaway on Twitter at https://twitter.com/#!/likwan/status/142646641906827264. I entered the Gorton's giveaway. I'd like to try the sauerkraut.